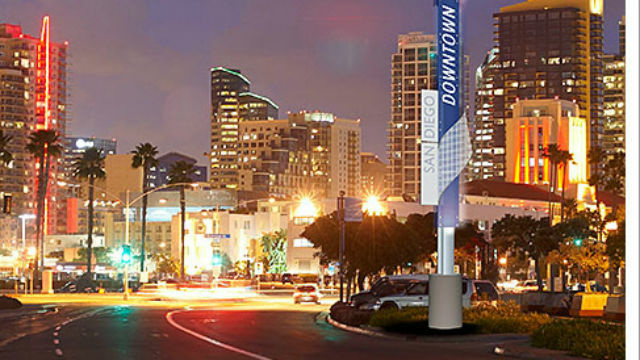 A $1.9 million project to install more than 200 signs giving directions to drivers, bikers and pedestrians downtown has been completed, according to Civic San Diego. The “wayfinding” signs point the way to attractions, education facilities, parks, museums, historic attractions and government buildings. They replace older signs that were only helpful to drivers. Downtown San Diego, with a maze of one-way streets, can be difficult to navigate for those unfamiliar with the area. The design, selected through three public open houses and nearly 50 stakeholder interviews, provides a consistent theme throughout downtown, according to the agency, which coordinates development for the city of San Diego. The project was funded by revenue from the Downtown Community Parking District and a $335,000 grant from the San Diego Association of Governments. The Downtown San Diego Partnership, Little Italy Association and Port of San Diego will help perform upkeep of the signs in their respective areas.